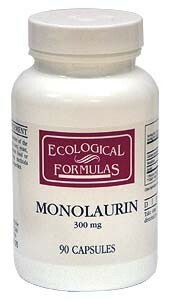 Monolaurin contains the monoester of the fatty acid lauric acid. Contains no corn, yeast, wheat, liver, citrus or other common food or chemical allergens. Manufacturing methods incorporate special delayed release properties. Research dating back 30 years first identified that the 12 carbon fatty acid2 of monolaurin was highly effective at combating gram positive bacteria and yeasts (like Candida albicans). The Candida killing ability of monolaurin3 has been established. The most research has been done on gram positive bacteria, as the compound can be used to reduce infections on poultry and help clean equipment involved in the production of food. And monolaurin is effective against many viruses. The nutrient has been in widespread use as an immune support dietary supplement for several decades. Gram positive bacteria are those that contain a thick mesh cell wall lattice made of sugars and amino acids. Disrupting this mesh-like outer cell wall is the key to stopping them from spreading. The troubling bacteria in this category are in the families of Streptococcus, Staphylococcus, Corynebacterium, Listeria, Bacillus, and Clostridium. Monolaurin has been found to incorporate itself into the cell membrane4 of gram positive bacteria and have the net effect of disturbing the integrity of its cell membrane, blocking replication and making it an easier enemy for your immune system to take care of. In 1992 University of Minnesota researchers demonstrated an additional way that monolaurin helps, showing that it could reduce the toxicity5 of Staphylococcus gram positive bacteria. More recently, another gram positive bacteria, Bacillus anthracis, has been thrust into public attention by the threat of its use in bioterrorism. Like many bacteria, it’s severity of infection is based on how much toxin it can produce. In 2005 the University of Minnesota researchers this time demonstrated that monolaurin inhibited the genes that enabled anthrax6 to generate toxins. In 2006 research they showed the mechanism of reducing gram positive infection toxicity7 applied to many organisms, indicating that monolaurin is likely to help reduce the toxicity of any gram positive infection by making it less severe. This research also found that healthy cells were made stronger by monolaurin, also helping them combat the toxicity. Monolaurin has demonstrated some ability to help regulate gram negative bacteria, one of which is the common intestinal inhabitant known as Helicobacter pylori (H. pylori). If H. pylori starts getting out of balance and turns hostile, like a bad gang in the neighborhood, then a lot of stomach distress can follow. Researchers have shown that monolaurin has a direct and potent germ killing effect on H. pyloria8, regardless of stomach pH. The H. pyloria8 germ killing ability of monolaurin has been confirmed9 by a second group of researchers. Exactly how monolaurin is able to kill these gram negative bacteria has not been identified. One study showed that while monolaurin was effective against Cytomegalovirus14 it was not effective against rhinoviruses, the cause of the common cold. There are many anecdotal reports of monolaurin helping combat the flu. Many of the types of viruses monolaurin helps are those that can be chronic low grade infections that deplete energy on a regular basis and flare up when you are stressed or down. If you have ever had a bad bug and never really got your energy back then monolaurin may help your immune system clean up the problem – even years later. Many find it useful for recurring mouth sores that are herpes-based problems. The new discovery that many lipid coated viruses can live in your stored fat and disturb your metabolism, promoting obesity, opens the door for the use of monolaurin to assist weight management – though no specific studies have been done on this topic. In summary, monolaurin is a nutritional fatty acid that is non toxic to humans and a friendly nutrient for human cell health. In contrast, it can be a knock out punch for gram positive bacteria and a number of difficult viral problems. It can also help to keep normal inhabitants of your digestive tract, such as H. Pylori and Candida albicans, in a better state of healthy balance. The information given in this article is not intended to be used in place of medical care for any bacterial, viral, or yeast infection, especially a serious one. It is simply provided for its educational value, helping you to understand how a nutritional fatty acid helps your immune system do its job. Always get medical care if you are sick with an infection. 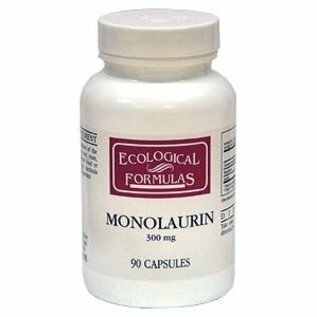 ^ Monolaurin Kills Candida and Gram Positive Bacteria Lipids. Kabara JJ, Vrable R.
^ Monolaurin and Caprylic Acid Kill Candida Antimicrob Agents Chemother. Bergsson G, Arnfinnsson J, Steingrímsson O , Thormar H.
^ Monolaurin Incorproates Into Gram Positive Bacteria Cell Membranes Appl Environ Microbiol. Tokarskyy O, Marshall DL. ^ Monolaurin Reduces Gram Positive Bacteria Toxicity Antimicrob Agents Chemother. Schlievert PM, Deringer JR, Kim MH, Projan SJ, Novick RP. ^ Severity of Gram Positive Infection Reduced by Monolaurin Antimicrob Agents Chemother. Vetter SM, Schlievert PM. ^ Monolaurin Stops Toxicity of Many Gram Positive Bacteria Biochemistry. Peterson ML, Schlievert PM. ^ Monolaurin Effective Against H. Pylori FEMS Immunol Med Microbiol. Sun CQ, O’Connor CJ, Roberton AM. ^ Monolaurin Kills H. Pylori Int J Antimicrob Agents. Bergsson G, Steingrímsson O, Thormar H.
^ Monolaurin and Skin Infection J Drugs Dermatol. Carpo BG, Verallo-Rowell VM, Kabara J. ^ Monolaurin and Superstrain Infections Appl Environ Microbiol. Dufour M, Manson JM, Bremer PJ, Dufour JP, Cook GM, Simmonds RS. ^ Monolaurin May Reduce Vancomycin Resistance J Bacteriol. Ruzin A, Novick RP. ^ Monolaurin Provides Broad Immune Support ALTERNATIVE & COMPLEMENTARY THERAPIES Shari Lieberman, Mary G. Enig, Harry G. Preuss. ^ Monolaurin Effective Against Cytomegalovirus J Med Microbiol. Clarke NM, May JT.